For international members, click here. To locate a member of the Imperial Order, simply click on your state (or on the above link for members outside the United States). This will list all members within the chosen region. Rehabbers will have a red (R) displayed after their names. Charter members� names will appear in gold. Hyperlinks to member websites (where available) and e-mail addresses are also provided. These addresses are to be used for personal communication with members only and are not to be used for spamming member e-mails with unsolicited adverisements or promotions. The webmaster is not responsible for out-of-date links as these can be updated only when members notify us of changes. We would appreciate members letting us know when their websites or e-mail addresses need to be updated. Thank you! We currently are purging our membership list for the first time since 1998. This is being done because a large number of our early members have changed e-mail addresses without notifying us, so many had dead links from our site. We are in the process of removing all names with out-of-date addresses, so if you were formerly a member and noticed that your name has disappeared from the list, please resubmit your information using the new membership form. You also may notice several members without hotlinks to their e-mail. Members now have the option of hiding their e-mail addresses for privacy reasons. If you need to contact someone who has an inactive link, please write to the webmaster and we will forward your message to them. Thanks! Website contents copyright � 2005-2007 by John Craton. 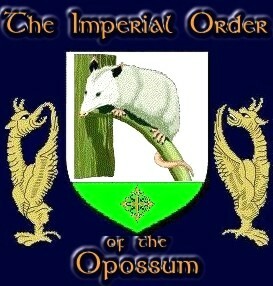 Return to the Imperial Order of the Opossum or to the �Possum Pages home page.